- Double knee operated valves with connecting hose and fittings. - Gooseneck spouts with aerator. - Strainer with basket and wall mounting brackets. - Heavy duty 16 gauge, #304 stainless steel construction. With the constant support of our expert team, we are engaged in offering a huge assortment of Two In One Kitchen Sink. This high grade Two In one Kitchen Sink is highly appreciated for its unique features such as superior quality, efficiency and optimum performance. We offer this Two In one Kitchen Sink in latest designs and models that meet all the requirements of our international clients. 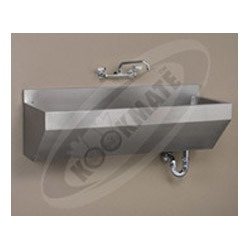 Matching up with the ever increasing requirements of the customers, we are engaged in providing Commercial Kitchen Sink. We bring forth vast industrial experience and expertise in this business, instrumental in providing Hand Wash Sink. 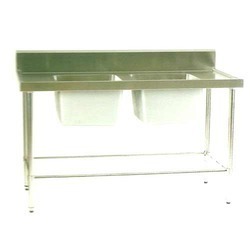 Size (Dimension): 32" X 20" X 30" -7"
Being a quality oriented organization, we are involved in providing supreme quality range of Canteen Wash Sink. We have carved a niche amongst the most dominant names in this domain, engaged in offering Dish Wash Sink.